Now that advertisements recognize you, flying cars are coming, and a Bond movie mostly uses off-the-shelf technology, we can say the future is really here. 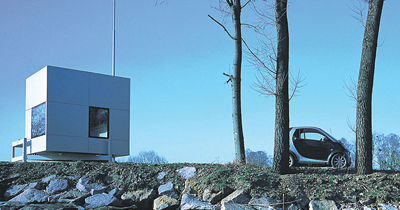 The micro compact home [m-ch] is a lightweight compact dwelling for one or two people. Its compact dimensions of 2.6m cube adapt it to a variety of sites and circumstances, and its functioning spaces of sleeping, working / dining, cooking and hygiene make it suitable for everyday use. While if taken to extremes, we could have quite a mobile dystopia, the compact and movable homes definitely have an appeal. Smaller spaces seem to be the only way to prevent stuff from accumulating when living in the western society. And as experiences are much more valuable than stuff, this is bad. Makes me think, especially as I have to find a new apartment by the end of July anyway. More pictures of the Micro Compact Home on Gizmodo.